Awareness, understanding and acceptance can come from the most unexpected of places. Every year we go on holiday, we have always strived to maintain a slight level of disorder and unpredictability to ensure that Dylan doesn’t come too stuck on a routine. Routines bring order and when the world seems like an unwelcome bustle, an irritating noise and unpleasant chaos, Dylan seeks order and predictability to make sense of the world and his place it in. However producing a reliance on a lifestyle where there is too much routine can create difficulties when events do eventually change- we are late or an appointment is cancelled or the weather is bad than this can cause such deep upset that Dylan cannot cope. There almost appears to be an intense grief, disbelief like his world could fall apart like this. This is called a meltdown: it is NOT a tantrum. It’s as if he focuses on what he does know will happen to get him through all the other stuff of the day. Dylan’s predictability and routine revolves day to day around food. So with routine and predictability being key to Dylan getting through the day something totally different like going abroad for an annual holiday can be difficult. With all the best planning and preparation in the world I cannot ensure flights leave on time. Airports can be noisy, unfriendly places full of bustle. Even if everything goes to plan there is what appears to be endless waiting -in queues (see yesterday’s post!). There’s new documents, processes, people and that’s before you even get out of the country! You get the gist of it. Travelling is stressful for everyone, even more so for Dylan. So for this reason we minimise our variables and travel in June; before the school holidays, before the rush of travellers, before it gets too hot and so that Dylan has a bit more time. Time to stop and have things explained, time to dip out of the queue to get away from the noise, time to stop and use his iPad to tell us he needs the toilet or needs something. And then while away, the holiday season is only just beginning so there’s not so many people, the sun’s not too hot – Dylan doesn’t recognise when he is hot or cold and will often wear his big winter coat with the hood up all through the summer (we don’t pack this with us!). Because of his inability to react to temperature Dylan is at high risk of sunstroke or burning due to not either picking up on or reacting to the feeling of burning. For Mark and I the work never stops of ensuring Dylan is safe and unable to wander, endless sun cream, endless water, always armbands the list goes on. But Dylan loves it. He loves the plane, he loves the sea, he loves Haroula Caroline Goudeli. As do Josh and Grace. That’s why a holiday is so important to us a family and sadly not possible during the busy hotter months. But Josh and Grace attend school and so every year I write a letter requesting permission to take them out for the holiday. Primary school have always said yes but this year is Josh’s first year at a secondary school: A school that does not tolerate in term holidays and has made this clear from before he began attending. I copied and pasted the same letter I use every year with a slight adjustment that Josh would ensure he was up to date with homework so he could integrate back to lessons after his return. 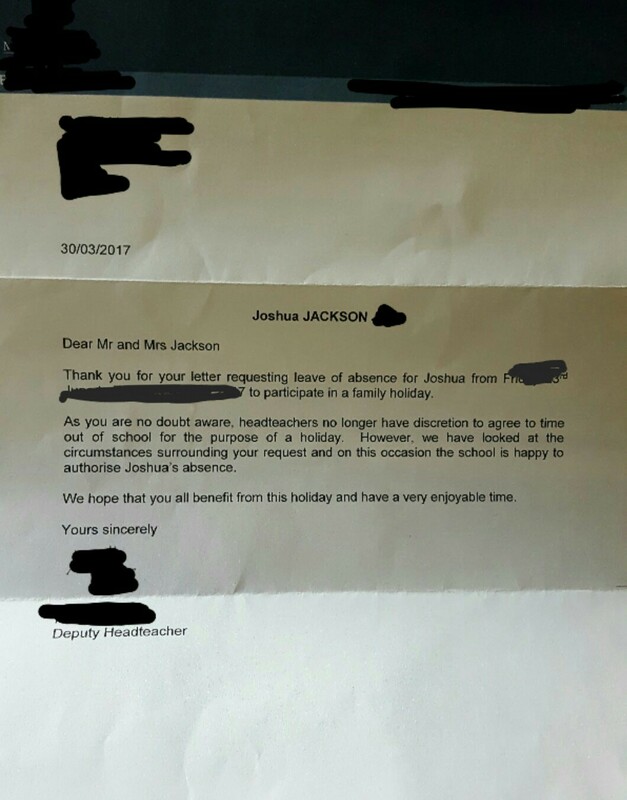 So this letter back from Josh’s school- support in light of our circumstances gives us as a family assurance of awareness, of understanding, it recognises our entitlement as a family to some quality time together whilst minimising the stress and anxiety around it that would create problems for Dylan in light of his autism. It doesn’t need to be a big gesture, it can be small. We can all make these allowances for someone who may need it. Be it allowing a patient a home visit instead of making them come to clinic or letting a child take a treasured item to school for comfort or reassurance. Society is slowly accomodating by introducing autism friendly shopping hours or cinema sessions all allow people who find these activities hard opportunities to attend. To attend and be comfortable. To feel accepted and understood. Yay, so glad for the holiday approval!